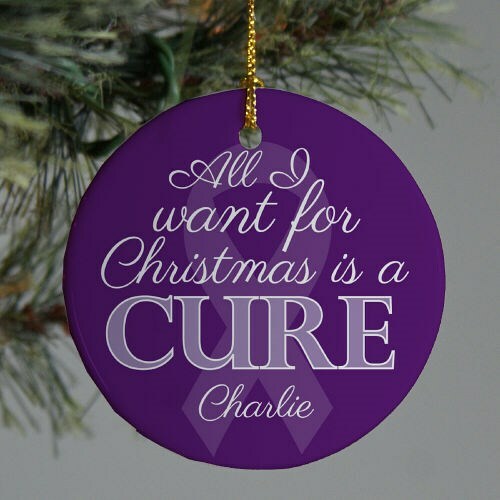 If all you want for Christmas is a cure to Alzheimer's disease, pancreatic cancer, or lupus, then this is the awareness ornament that you'll want to hang on your holiday tree. This is also a great ornament for celebrating all cancer survivors. This "All I Want for Christmas is a CURE" Ceramic Ornament is a flat ornament and measures 2.75" in diameter. The Ornament includes a ribbon loop so it can easily hang from your tree or ornament stand. Free personalization of any name is included. Give this awareness ornament to friends or family members who might be struggling with Alzheimer's, lupus or pancreatic cancer. This will be a solid show of support for their cause. Our Glass Engraved Survivor Ornament is another best seller.